Built on top of the powerful gantry framework, flatmetro is with no doubt one of the most unique joomla-metro combination of its kind. Built for one of the most common design trends of 2013-2014. Highly responsive, and uses many unique features of its own, smooth transitions and a lot to discover. 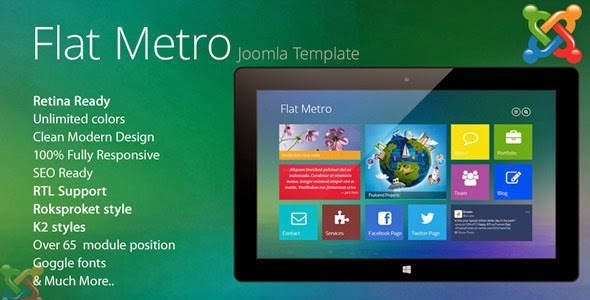 Flatmetro comes is joomla 2.5.7 and 3.2 compatible. Item Reviewed: Flat-Metro Responsive Multipurpose Joomla Theme 9 out of 10 based on 10 ratings. 9 user reviews.